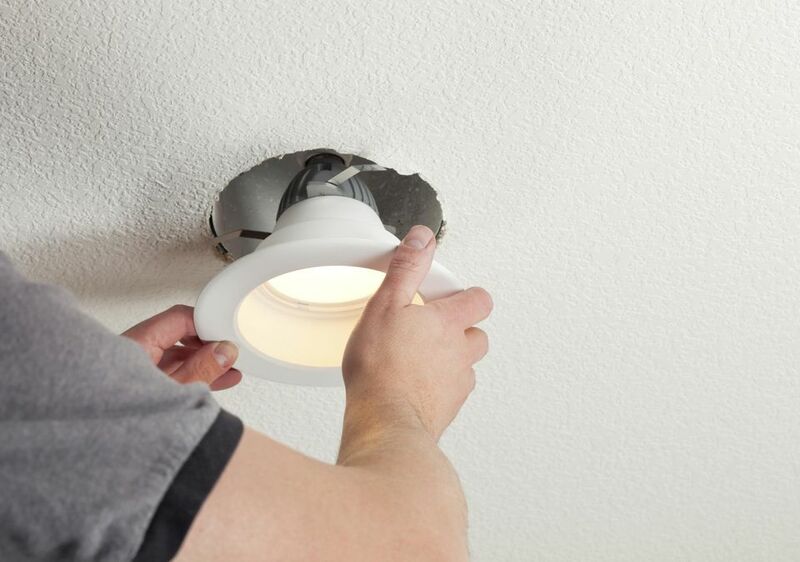 Installing recessed lighting is made easier by carefully choosing the right fixture. One important point is that you do not have to use an "Old Work" fixture just because you want to mount the light in an existing ceiling. "New Construction" fixtures are, as the name implies, designed to be mounted in open joisting and then surrounded by the new ceiling material. Certainly, if that's the nature of your project, these are the fixtures to use. But, if the space above the ceiling is accessible, you should probably use new construction fixtures anyway. You're going to want to be above the ceiling to run the wire, so why not mount the fixtures while you're there? Besides, new construction fixtures are usually less expensive than comparable remodel fixtures, and often have a wider variety of trim available. Before installing the lights, you also need to determine how you're going to wire them. And how you're going to control them. In our kitchen and breakfast area, for example, we have six recessed lights. They are controlled by three switches. Four of the lights - the large one in the center of the kitchen and three of the smaller task lights above the counters - are wired together. There are separate switches for the light over the sink and the one above the desk space in the breakfast area. That allows us to control the lighting to suit what we are doing at the moment. If you are planning to install a series, or group, of lights, plan the wiring to run from one to another in a "daisy-chain." A spiral or S-shape layout can help. Place one of the housings in front of a wall or a scrap board and push the lamp housing as far as it will go toward the closer end of the parallel mounting arms. Measure back from the wall or board to the center of the housing. That's the least distance you can set a light from any ceiling joist without modifying the framing. Use a stud finder to give you an approximate idea of where the ceiling joists are. With a pencil, mark on the ceiling your ideal location for the center of each new light. Drill through each of your marks with a small drill bit - 1/8" or so. Cut a piece of coathanger wire, or something similar, that you can push up through each drilled hole, and that will stay in place. Push the coathanger wires into place. In the attic, measure from each of your wires to the closest joist. If any of the measurements are less than the minimum you determined earlier, move the marker wire over and twist it back down. Go back to the room and see if you can live with the changes. Make any necessary adjustments. Use a template or a circle scribe to mark the cutout for each light, and a drywall saw, slanted outward, to cut the openings. In the attic, screw the mounting arms to the joists. It is what these fixtures were made for. To make locating several fixtures in a straight line easier, stretch a string between two nails or screws along the line where you want the center of the lights to be. To do this parallel to the joisting, tack a scrap piece of wood across the joist bay at each end, beyond the last light, and set your nail or screw in that. Lift each housing into place and hammer two of the setting prongs - diagonally opposite ones - into the joists. Attach all four ends of the two pairs of mounting arms with screws. To keep the fixtures from sliding out of place before you get the ceiling up, run a short, self-tapping screw through a place where the mounting arms overlap on each fixture. Each of your recessed lights should have a splice box attached to it. Run each length of cable to end inside one of those boxes. Remember to drill through the joists, halfway from top to bottom, to wire across them, and to staple the cable along the center of a joist as you wire parallel to the framing. Strip your cable so that the end of the jacket will be just inside the splice box. Install a connector or use the clamp openings, if they are provided, to insert and secure your cable. Install your new ceiling, if needed. Install the trim you have chosen for each light. Install the lamps (light bulbs). Note: You may need to install the light bulb before you install the trim, depending on the trim you have selected.